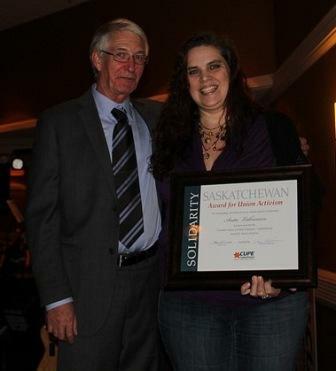 Anita Labossiere, President of CUPE Local 3736, was presented with the Saskatchewan Activist Award on March 6, 2014 in recognition of her courage and resolve advocating for fellow members in the face of the devastating news that the North Sask Laundry facility in Prince Albert will permanently close due to the Provincial Government’s controversial decision to privatize health care laundry in Saskatchewan. Over 400 workers across the province, including members of CUPE Local 3736, face job loss as a direct result of health care laundry privatization. “I took a vow to stand up for each and every one of my members,” said Labossiere who received the award to a standing ovation and cheers. The annual award recognizes CUPE members who display outstanding dedication in representing their fellow members and advancing greater economic fairness and social justice.